As you might have noticed, my blog and Facebook page have been super silent for the past weeks. I felt like I needed to take a little break from crafting due to a total lack of inspiration and interest, which I am happy to say that now is finally over. 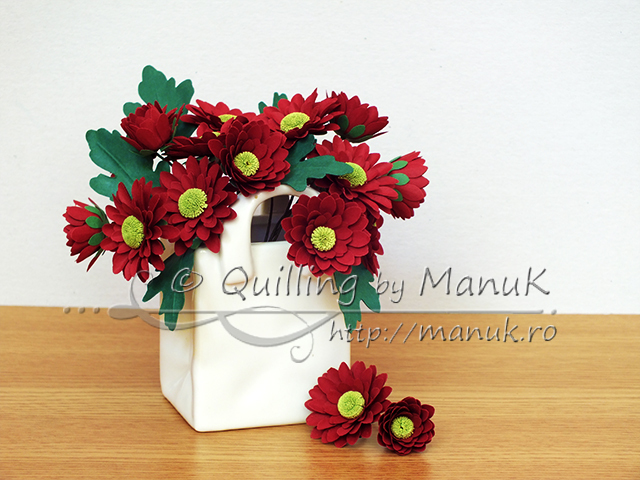 My first project after this “mini summer holiday” is a combination between paper punch craft and a hint of quilling: paper chrysanthemums in a vase. I’ve been meaning to purchase some paper punches for a long, long time, but for some reason I always ended up postponing it. I owe a big thank you to Cristina who convinced me to finally buy some and was sweet enough to start my collection by gifting me 4 punches! These paper chrysanthemums are among my first flowers ever made using this crafting technique. Again, my plans to make a greeting card failed, so I ended up stemming each flower and creating a three dimensional arrangement by placing them in a pretty white vase which resembles a shopping bag. I used 120gsm paper for the flowers and leaves. The size of the arrangement is approx. 12cm tall and 13cm wide and the diameter of the open flowers is approx. 3.7cm. It sure is easy to make flowers using punches and if you compare this method with quilling, then it definitely takes infinite less time! It even felt a little bit strange because I didn’t have to cut my paper strips, and wow, what a difference that made! I found myself spending more time cutting the leaves, trying to put everything together and then taking pictures to post them here. This is all for now! I am currently working on a tutorial for these paper chrysanthemums, so if you want to see how I made the flowers and leaves, make sure to visit my blog again in a few days! Sunt deosebit de frumoase!! Ai o mana la flori!!!!! Iti ies mereu fantastice!! Cred ca pot spune ca asta e punctul tau forte!!! Felicitari !!! Insa vazand pozele mereu iau plasa la dimensiune 🙂 Trebuie sa fiu atenta la descriere ca sa-mi dau seama cat de mari sunt, pozele le arata imense marime naturala aproape!! pupici si spor la alte flori!!!! Nu te opri!!!!! Multumesc mult de tot pentru incurajari, Cris! Ai dreptate, cel mai mult imi place sa fac flori, cred ca asta este motivul pentru care imi ies mai bine decat alte lucrari! Haha! Tocmai asta e motivul pentru care trec de fiecare data si dimensiunile, nu vreau sa induc lumea in eroare! Pupici si mult spor si tie! Manuela! This is something new I’ve seen you do. Well done! I would love to see the tutorial. Where do you get that gorgeous paper – that’a a beautiful, juicy red. Thank you, Zoe! I bought the papers from a local craft shop, they come in a set of 10 sheets and the brand is EFCO, color dark red. Hope it helps! Awesome…Watever projects u do…its just filled with such perfection, dedication, passion…Just loved this project of yours, Manu!!! Sathya, thank you so much! Hugs! Wow ! Like all the flowers you make .these ones also look so.. real..Looking forward to the tutorial. Thank you very much, Pooja! Stay tuned for next week! WOW they look amazing. I hope the punch bug has bitten you ..you will churn up so many beauties!! Sonia, thank you, it means so much coming from you! Hehe, it definitely has and I’m loving it! this is so pretty. I have a similar die cut but the petals are not as pretty as your. what kind of punch is that? I look forward to the tutorial. Thank you, Helen! The punches are from dpCrafts, I’ll post photos next week! You have a taste to make everyting beautiful – these chrisatemums and the white ones ane so lovely designed and done by you! Every project is 3D – no flat images, so real. Pls continue to make us happy! Thank you, Maria! I love reading your encouraging comments! Hugs! Hi Manu, another magnificent creation and the red you have used is just perfect for the flower. The leaves are gorgeous too. Love it like all your other projects. Thank you, Chris! It means a lot coming from you! Hugs!